Today I have China Glaze's standout offering from the fall All Aboard collection, Choo-Choo Choose You. 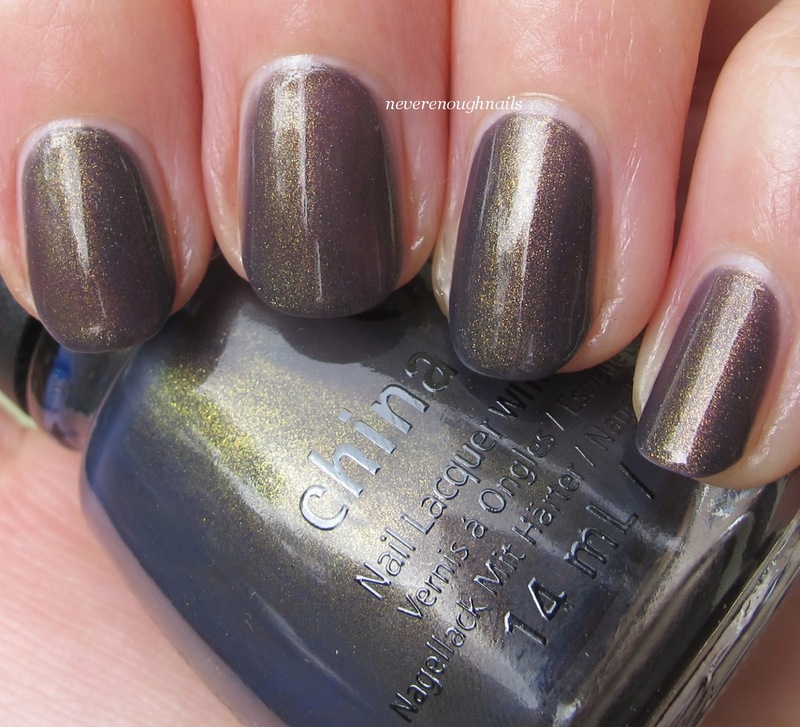 Choo-Choo Choose You is a purple-gray with golden green shimmer that is almost duochrome-like in some lights. Depending on the light, the base color looks more purple, or more gray, and the shimmer can look gold or very green. It's a very interesting polish color and pretty unique in my collection. I tried to take extra pictures to show how different this can look in different lights. I think this one below came closest to showing how green the shimmer looks, but my hand position resulted in a lot of reflections. This is three coats of Choo-Choo Choose You. It was pretty much opaque in two, but I did the third to ensure there wouldn't be any VNL. It was easy to apply, maybe a little on the thinner side, but not problematic. China Glaze collections have not been catching my eye lately, but All Aboard had a few polishes I was interested in, so you'll see a few more over the course of the fall. Choo-Choo Choose You is the coolest one by far and a Must Have polish for me for fall 2014. I purchased mine from 8ty8beauty.com, but the I believe collection is still around in various brick and mortar stores like Sally Beauty and Ulta. I need to go out and find this polish. It's such a beauty and very unique for China Glaze! I still have it on now Ananka and yesterday one of my guy friends grabbed my hand to look at it LOL! Love that!